Glycolysis is the principal pathway of glucose metabolism occurs in the cytoplasm of all cells where glucose is oxidized to pyruvate (in aerobic condition) or lactate (in anaerobic condition) and generates energy in the form of ATP. Aerobic glycolysis – Aerobic glycolysis occurs in cells with mitochondria and in the presence of oxygen. In aerobic glycolysis pathway, each molecule of glucose oxidizes and produces two molecules of ATP, two molecules of pyruvate, and two molecules of NADH. Pyruvate is converted into Acetyl CoA by oxidative decarboxylation that is utilized in the citric acid cycle. Two molecules of NADH give rise to 6 molecules of ATP in the respiratory chain oxidation. Therefore, net production of energy in aerobic glycolysis is 8 molecules of ATP. Anaerobic glycolysis – Here, oxidation of glucose occurs without participation of oxygen. Glucose is converted into pyruvate that is reduced by NADH to form lactate. Therefore, in anaerobic glycolysis pathway, each molecule of glucose provides two molecules of ATP and two molecules of lactate. Lactate is used in the liver for gluconeogenesis. Anaerobic glycolysis is a valuable source of ATP in tissues that lack mitochondria, such as mature red blood cells, leukocytes, lens and cornea of the eyes, retina, renal medulla, and testes or in cells deprived of sufficient oxygen such as in hypoxic state, shock, and during intensive exercise. Oxidation of glucose to pyruvate or lactate via glycolysis occurs in two stages. First stage is energy investment phase and consists of first five reactions of glycolysis in which phosphorylated forms of intermediates are produced at the expense of ATP. Last stage is energy generating phase and consists of subsequent five reactions of glycolysis in which pyruvate is formed with generation of 2 molecules of ATP and 2 molecules of NADH, or lactate is formed with generation of only 2 molecules of ATP. 1) Phosphorylation of glucose: Phosphorylation of glucose to glucose 6-phosphate. This reaction is catalyzed by enzyme hexokinase in most tissues or by enzyme glucokinase (an isoenzyme of hexokinase) in liver cells and islet cells of pancreas. 2) Isomerization of glucose 6-phosphate: Isomerization of glucose 6-phosphate is catalyzed by enzyme phosphoglucose isomerase producing fructose 6-phosphate. 3) Phosphorylation of fructose 6-phosphate: This reaction includes phosphorylation of fructose 6-phosis into fructose 1, 6-bisphosphate, catalyzed by enzyme phosphofructokinase. 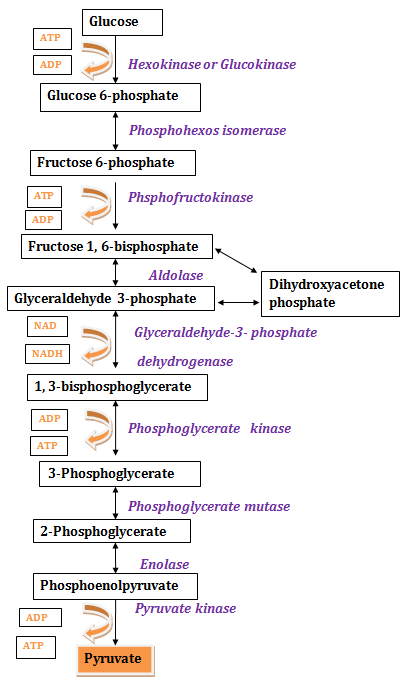 4) Cleavage of fructose 1, 6-bisphosphate: This reaction is catalyzed by enzyme aldolase in which fructose 1, 6-bisphosphate is cleaved into glyceraldehyde 3-phosphate and dihydroxyacetone phosphate. 5) Isomerization of dihydroxyacetone phosphate: Glyceraldehyde 3-phosphate and dihydroxyacetone phosphate are interconverted by enzyme phosphotriose isomerase. Dihydroxyacetone phosphate must be isomerized into glyceraldehyde 3-phosphate for further metabolism. 6) Oxidation of glyceraldehyde 3-phosphate: Glyceraldehyde 3-phosphate is oxidized to 1, 3 bisphosphoglycerate with the help of glyceraldehyde 3-phosphate dehydrogenase enzyme. This reaction is NAD+ dependent. 7) Synthesis of 3-phosphoglycerate and ATP: The phosphate of 1, 3-bisphosphoglycerate is transferred to ADP by enzyme phosphoglycerate kinase, producing ATP and 3-phosphoglycerate. 8) Isomerization of 3-phosphoglycerate: This reaction is catalyzed by phosphoglycerate mutase in which 3-phosphoglycerate is isomerized into 2-phosphoglycerate. 9) Dehydration of 2-phosphoglycerate: This reaction is catalyzed by enolase and involves a dehydration, producing phosphoenolpyruvate. 10) Synthesis of pyruvate and ATP: This reaction is catalyzed by enzyme pyruvate kinase, phosphate is transferred from phosphoenolpyruvate onto ADP, producing ATP and pyruvate. Under anaerobic environment, NADH cannot be reoxidized via respiratory chain to oxygen. Pyruvate is reduced by NADH to lactate with the help of enzyme lactate dehydrogenase. Under aerobic environment, pyruvate enters into mitochondria of cells where it is converted into Acetyl CoA through oxidative decarboxylation that is used in the citric acid cycle.